Crack your eggs on a flat surface to avoid getting bits of the shell in your food. Invest in a microplane to make prepping garlic and ginger so much easier. You can also use a microplane to grate hard cheeses, chocolate, and whole spices (like cinnamon or nutmeg). See all the things you can do with them here. Don't use butter or olive oil for high-temp cooking ― instead, use an oil with a high smoke point (like peanut or vegetable oil). See even more reasons why you shouldn't always cook with olive oil here. Completely read your recipe before you start cooking. Remember that acid (such as lemon juice or vinegar) brightens flavors and brings bland food to life. You can also use vinegars and wine to add acid, just remember that a little goes a long way. Learn more about seasoning with acid here. Use a teaspoon to easily peel ginger without having to struggle with a knife or peeler. Simply run it against the surface to remove the skin without taking off too much flesh. See how to do it here. 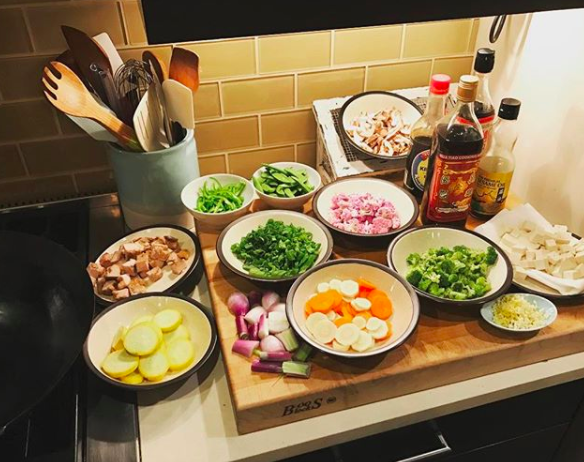 Have all your ingredients prepped, measured, and ready to go before you start cooking. Learn even more about seasoning as you go here. But if you do add too much salt, throw a quartered potato in to tone down the flavor and absorb some of the excess. Check out even more ways to fix a salty dish here. Cook bacon in the oven instead of a frying pan for perfectly crisp strips that are a breeze to clean up. Prevent cut vegetables from oxidizing and turning brown by storing them in cold water. This technique also works for other fruits and veggies like apples or avocados ― anything that turns brown after it's been cut. Invest in an instant-read thermometer so you don't have to guess if your meats are cooked in the middle. Get it online ($24.99 on Amazon). Dry your proteins with a paper towel to achieve a perfect sear. Don't be tempted to over mix your cake batters ― a quick stir is all you need to combine your wet and dry ingredients. Learn even more about mixing cake batter (and more importantly, how to avoid over mixing it) here. Use the figure-eight stirring technique to prevent the bottom of your pan from scorching. This is especially helpful for thick liquids such as gravy or tomato sauce that are prone to burning. When thickening a sauce with a roux, add your liquid a little at a time to prevent it from clumping up. When it comes time to add the liquid, make sure it's hot. A cold liquid will cause a roux to seize up and result in a chunky texture. Learn how to make roux here. To prevent your cutting board from slipping around, place a wet paper towel underneath. Not only will it make chopping easier, but it will also make sure there are no accidents that may cause your knife to slip.